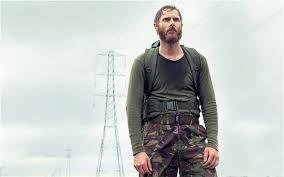 Sean Harris playing Stephen Morton in Channel 4’s Southcliffe. From the moment the 4-part drama Southcliffe was advertised on Channel 4, I knew that it would be controversial and shocking with its story of a mad gunman gone off on a rampage in his local community. The opening scenes confirmed this when he was seen shooting an old lady as she was gardening and then other shots going off in the distance as he continued on his way. What follows is the back-story into the decent of his madness and how he came to kill innocent people. I say innocent but in his eyes they are all guilty of something. Here in the UK we are lucky that our gun laws are amongst the tightest in the world and that our police don’t really need guns; but it is recognised that they still need to be tighter for no civilian should ever need to own a gun for any reason really. It should only be for those in the armed forces and those that are paid to protect us. Sportsman I also recognise as well as long as the weapons are kept away at a club and not at their homes and they’re never allowed to remove them from the club and monitored at all times. Southcliffe focuses on all the residents of the fictional small coastal town and asks why them? Why were they chosen? Were they random or where they picked out for a reason? Or were they simply just in the way? All the victims and their families have back-stories of their own. One has been having an affair, another is a returned soldier who seems to be suffering from Post Traumatic Stress Disorder and a few others who all have links with the main protagonist and killer, Stephen Morton, played by the brilliant Sean Harris. He is nicknamed the Commander for he lives in a fantasy world where he tells everyone he served with the SAS and briefly one returned soldier believes him and goes training with him until he learns the truth and finds someone who really did serve in the SAS. They subsequently beat him up. Each episode switches from past to present and some may get confused by where the storyline is or what’s happening but it’s quite simple if you concentrate. There tends to be a trend for quiet, mumbled speech above a loud soundtrack of late and Southcliffe is no exception but for me it just adds to the tension, especially with Sean Harris’ character, Stephen Morton. It gives him a creepy and disturbed aura. Also with each episode, the start, middle and end all have very brief and shocking moments of gunshots in the distance or in the mist with a shadowy figure or Morton clearly seen with gun in hand. But what I find interesting about his character is the fact that you almost feel sorry for him. He lives with his Mum who suffers from Dementia or Alzheimer’s and he refuses to put her in a home or let anyone take care of her because he simply loves her. Then the flashback’s show him being bullied by many in his town as a kid and even as an adult. A carer; Claire Salter played by the fantastic Shirley Henderson (Moaning Myrtle from Harry Potter) visits his home to help with his Mum and tries everything to help him but she too is very worried about him and where his mind is at. She knows he cares and subsequent calls to her office from him disturb her. It’s not until later that she regrets not calling him back. At least that’s the impression I got. 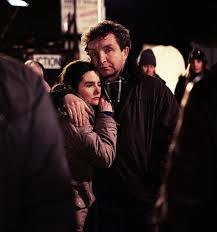 Eddie Marsan as her husband is brilliant and is worth the license fee alone in anything he does. I still want him to be Doctor Who someday. Maybe he can be the 13th incarnation? There are many moments like this with many regrets and strands all leading back to the treatment of Morton and how he sees things. Whatever his reasons though there can be no excuse for his actions but again, this leads on to the way we treat our own people, our neighbours, our friends, our families and even strangers. We live in an ever-growing world with constant stress and pressure on a lot of us with many having no purpose in life they believe, just a ghost of an existence so is it any wonder that some of us snap? Whose fault is it really? Them for not being in control of their own lives or us for pushing their buttons and not looking out or being there for our fellow human beings? It’s a huge question and one that will be debatable for decades, centuries even for humankind can be selfish and fearful. There was a one-off drama some years back called Boy-A which focused on the killing of a small child by teenagers based on the Jamie Bulgar killing. It was seen through the eyes of one of the killers and how he tried to redeem himself and even though you knew what he had done, you were rooting for him to be at peace and do the right thing. Find it online and watch it. There are two episodes to go of Southcliffe to be held over the next two Sundays and I have a funny feeling it will get only more shocking and stronger. I’ll update this post to include those two episodes when it is finished. Until then may I suggest that if you haven’t seen it then please do. It is one of the strongest and most shocking dramas you will see simply because it is so close to past crimes. It is very powerful and the acting, camera-work, writing and directing are all first class and you will be awed at what you see. The quiet moments will stun you as the shots ring out, leaving you unnerved and slightly numb. It simply is a stunning piece of work and I hope it does good and not harm in any way, highlighting the need for a total ban on all guns and a total crackdown on the criminal underworld who own them as well. I also hope that it somehow helps the victims of this sort of crime in some way and highlights the need for this never to happen again. So Southcliffe ended last night on what was a strange and unusual ending that couldn’t have been otherwise I suppose. What started off as a man pushed to the edge and a community falling apart, trying to come to terms with what had been done to them, soon focused on the journalist, David Whitehead and former resident of Southcliffe, the ex-soldier, Chris Cooper who had an association and very brief friendship with Stephen Norton and the Salter’s who were torn apart by the death of their child by Norton. It was about them all trying to get there lives back on track and right wrongs too if they could. David Whitehead played by the excellent Rory Kinnear felt responsible for Norton’s decent and blamed the whole town for his actions too and what followed was Whitehead receiving a message a year after the events that threatened to start the whole thing off again. It stated that Norton was still alive and would return to finish what he started but another story unfolded showing heartbreak so raw that you felt the tension and nerves of the characters involved. You momentarily forgot that you were watching actors playing a part and being directed in a drama. That’s how high the calibre of the show was and I can still feel it almost twenty-four hours after it finished. I’m trying not to give too much away so you can watch it for yourselves but what I will say is that the ending is strange to say the least. You are left with questions and no answers, yet you can forgive the writers for leaving it this way because it is how you would expect real life to be under the circumstances. I can only repeat what I have said before and that’s watch it and judge for yourself. I defiantly smell awards for it. Well done to all involved in such a brilliant piece of well handled drama. Re: Here in the UK we are lucky that our gun laws are amongst the tightest in the world and that our police don’t really need guns; but it is recognised that they still need to be tighter for no civilian should ever need to own a gun for any reason really. It should only be for those in the armed forces and those that are paid to protect us. Govt. should fear the people and not the other way around. History teaches that unarmed citizens are little better than slaves at the mercy of the agents of the govt they live under. This is one of the reasons that Americans fought, defeated and threw the British out of the colonies after they declared their independence. Okay David. Hope all is well? first up, sorry it’s taken me a while in replying to you. I’ve been out of the loop for a bit. Thank you for the likes and comments; always appreciated. Indeed governments should be afraid of their people and people should not be afraid of their governments but you missed the point of this post. I don’t know if you watched the programme online and researched the crimes; indeed massacres that the drama was trying to show in its cold and horrific way. I had no intention of offending anyone and this post was not anti-America or anti-any country but it is anti-gun. The old rhetoric about it’s not the gun that kills people but the person who pulls the trigger is just an excuse used by those that own them and play at being soldiers. In reality they fear life itself and live in a paranoid bubble which I find sad and very dangerous. This is a mental health problem and the cause of such massacres on innocent people that will continue to happen unless something is done to stop it. If you watch the show and read up on all of these crimes you will see a link in same way or form, but it’s the ease in which they get these weapons and why they need to own them? Now to the rest of your reply. Pretty much all I remember being taught about it at school and browsing through my little book, the only reason the settlers turned on ‘Mad’ King George III was because he needed taxes to pay for the wars in France and Spain. This is why Britain, a tiny island that dominated half the known world at the time; failed in keeping hold of America and why they gave up at the time. Resources were needed elsewhere. Britain wasn’t ‘kicked out,’ it just gave up. In the end though you could say that Britain won for it gave America its laws, its language, its culture, its building designs and so much more. It even built ships for them when America went to war with itself over taxes amongst other things. Money is the root of all evil isn’t it as well as the lust for power. Greed. Ironic don’t you think? The British were on the side of the Confederates by the way but dallied with the Union as well. Trade was still important. Now I could go on to say about how the Americans slaughtered the natives where the British tried to learn from them and respected them. Yes, I’m sure there were barbaric acts done by the British but not on the level of what was done by the Americans. It borders on genocide and probably should be classed as such. Again, this isn’t about slating America but the gun and those that own them. Now to the important bit, the part which this reply is on about. Basically it comes down to the ‘right to bear arms’ part under the United States Constitution (1787); Amendment II. Now forgive me if I’m wrong here, but the ordinary person is not part of a Militia and never was. That Amendment was set up in accordance with defence against the British and King George III. It was set up for no other reason but sadly today it has been taken out of proportion and is outdated and wrong. People seem to read the ‘the right of the people to keep and bear arms bit and miss out the rest for convenience I suppose so in reality a huge proportion of the country is breaking the law in owning a gun as are shops selling them to average citizens. This is why America is a ‘warzone’ and why many innocents suffer at the hands of ignorance and misinterpretation. This is no different from those that use religious books to their own needs and desires; usually at the suffering of others, of innocent people. Interesting isn’t it? Once again, we’re lucky here that our gun laws are so tight otherwise we would be in a similar state to countries like the US I believe. Even our police are not armed; just a select group of specially trained officers and they are under strict instructions not to fire if possible, only to injure unless absolutely necessary but the same goes for many countries I expect in this respect. You also never see in the news here of criminals in a shoot-out with police simply because most deem it unnecessary to use a gun. They’re almost civilised if there’s such a thing as a civilised criminal although there are still nutters about. One last thing before I jump off my soapbox (I’ve been typing a while now and I’m all sore in the shoulders! ); Our Queen as a constitutional Monarch has the right to raise a Militia if she thinks that her government will do harm to the country and her people. It will never happen of course but it’s thee anyway for her to use should she wish to. Speaking as a citizen of the UK, I doubt very much that this will happen. The recent news in Cairo shows that; even though the people are not armed and the government and military are, the people will not take things lying done for they outnumber those in power by huge numbers. The same goes for here, America and any country in the world. So you see guns are unnecessary but people taking control when it is needed one day simply is. We have the power in our hearts, souls and minds, not in a piece of metal that causes more damage than can be imagined. I have friends in America who have had enough of the violence and are moving to the UK and other parts of Europe next year. Very sad that they’re forced to leave their homes. Right, I’m done. I think that’s my soapbox bit done now. I’ll add to it if I think of anything else and apologies for any grammar or spelling mistakes. My eyes are tired! I hope you’re not offended. Be safe and be well. I could write an entire dissertation on your response but I will focus on a few main points. You are right in saying that taxation without representation was an issue, but not what let to open armed rebellion. The actual armed rebellion of the colonist began when the British began to confiscate weapons and gunpowder in 1774. This was the main act of the king which started the futile uprising. The second amendment: oh boy…. First, “the militia” is the average person, and was defined so by the us supreme court in case DC vs Heller. Also, the entire second amendment is entirely misread time and time again. People read it and don’t even look at the subject context of it. The right to bear arms is not granted to the militia, no where in the amendment does it say this. The right is reserved for the people, the militia is secondary. The writers recognized the inaliable right of citizens to arm themselves, and then merely stated a fact, that and armed population is necessary in a free state. Read it again in subject contect. Saying that the second amendment is outdated, is as rediculous as saying the first only applies to quill pens and town criers. You need to read the Federalist papers to get a more clear understanding of the founders intentions.